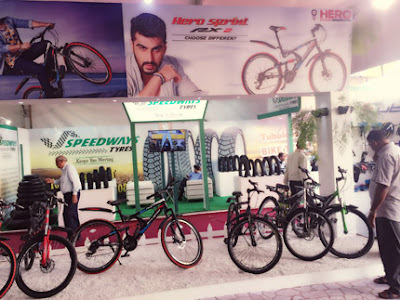 World’s largest bicycle manufacturer Hero Cycles is showcasing a series of its latest brands, from premium to mass products, at the largest exhibition of India’s bicycle, fitness and sports industry that opened today in Ludhiana. A unique platform for establishing business ties, the annual exhibition brings together dealers, distributors, importers, entrepreneurs and manufacturers from across the country to Ludhiana every year to scout for business opportunities. A haven for fitness enthusiasts, the exhibition showcases the latest innovation and technology in the field of bicycles, fitness equipment and outdoor sports equipment. Hero Cycles, the leader in India’s bicycle industry, is showcasing one of the largest cycle stalls at the exhibition, dedicated to its wide gamut of products and brands, most of which have a separate catchment zone. From high-end technology-driven fitness bikes that dominate the premium segment to mass consumption products that are part of everyday Indian’s lives, Hero Cycles has an enviably large portfolio of products. The twin objectives of Hero’s participation at the expo are to display its new models, as also showcase the grandness of the portfolio of products that Hero has on board to offer. “This exhibition is a very fruitful platform for all stakeholders involved in the bicycle and fitness segment, which is emerging as a fast growing sector in India. Not only for business opportunities, this expo is also very interesting from the perspective of the consumers. A large number of people from all walks of life visit the expo and take a first-hand look at what is new in the cycling industry. Bicycling as a fitness activity is gaining new converts in India today with rising awareness about the need to maintain fitness and physical activity. In the coming decade, we are sure to see more and more people take to bicycling as a fitness and leisure activity. Hero Cycles takes pride in the fact that it caters to each and every segment of Indian bicycle consumer – from mass to premium. We are showcasing our wide gamut of products at the expo,” said Mr. Pankaj Munjal, Managing Director, Hero Cycles. Among major attractions that Hero Cycles is exhibiting at the expo is the latest range of 15 new active sports products in the premium UT/ UT Edge brands. Specially dedicated to fitness enthusiasts and people who prefer cycling as a workout and leisure activity, the products in the UT and UT EDGE range are performance savvy and technology driven. With feature driven components that enhance the cycling experience and a design finish in fashionable colors, the UT products are sure to catch the attention of fitness enthusiasts. Hero Cycles marked its entry into the high-end European bicycle market with the acquisition of Avocet Sports last year, which was Hero Cycles’ first overseas acquisition. At the same time, Hero Cycles also acquired Firefox Bikes as a strategic move to cement its position in the fast-growing premium cycling segment in India. Hero Cycles has been aggressively driving growth by clocking a robust 11% growth in the Indian market. With the acquisition of 'Firefox Bikes' Hero Cycles now also commands dominance in the double-digit growing premium segment and continues to maintain its dominance in the mass segment with over 45% share. Incorporated in 1956, Hero Cycles Limited is the largest bicycle manufacturer by volume in the world. The company has a manufacturing capacity of 7.5 million bicycles per year, with its units in Ludhiana (Punjab), Bihta (Bihar) & Ghaziabad (UP). Hero Cycles has been aggressively driving growth by clocking a robust 11% growth in the Indian market. It has a highly integrated plant in Ludhiana which produces 19,000 bicycles every day. It also manufactures automotive rims and various other precision-engineered auto components. Hero Cycles posted a turnover of around Rs 3000 crores during the financial year 2014-15 with a production of around 5.5 million cycles. It is the leader in both the standard and specialist bicycle segments in India, with an overall market share of about 41 per cent.